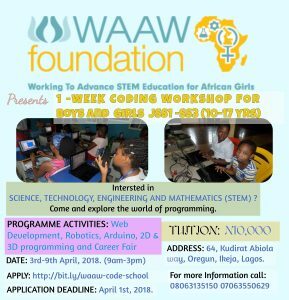 The Working to Advance STEM Education for African Women (WAAW) Foundation with the mission is to empower African women and young minds to become impactful leaders, change agents and technology innovators through STEM engagement is organizing a code school this Easter holiday for boys and girls (10-17 years) in JSS1-SS3 from April 3rd to 7th (9am-3pm daily) at 64 Kudirat Abiola Way, Oregun, Lagos. The uniqueness of WAAW Lagos code school is in its teaching methodology and learning resources. Participants at the code school will learn with unique methodology that is suitable for critical and creative thinking. At WAAW Foundation, we believe that young minds are plain platforms, flexible enough to receive as much and ready to take in anything new. 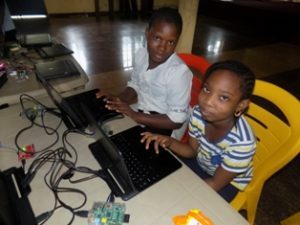 It is therefore important that they have productive events around them to make them resourceful and enhance their skills in making favorable use of technology. This eventually leads them to become community change agents by using technology to solve problems. So, WAAW Foundation designed a creative and easy-to-learn curriculum for summer Code school. There are no bounds to the curiosity, creativity, critical thinking and logical reasoning of these young minds. They may as well have a mind blowing yet simple solution to the various challenges in our society. Hence, WAAW is developing the teenagers early for such innovation to happen.